Serenity Now: *Blessings Unlimited* Christmas Giveaway...from Me! *Blessings Unlimited* Christmas Giveaway...from Me! It's been awhile since I've hosted a Giveaway (from me) here on the blog. So many of you have left thoughtful and encouraging comments since I mentioned signing on with Blessings Unlimited that I wanted to share the love. 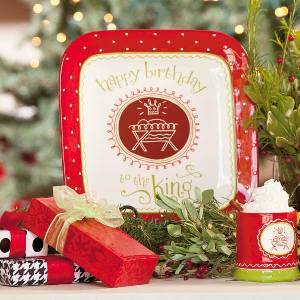 I'm going to give away one Happy Birthday to the King Platter (valued at $26) to a reader! This new collection was so popular that it has completely sold out for this year, but I saved one platter. It's 12 inches square, dishwasher and microwave safe, very sturdy. I love the fun lime green and red Christmas color combo! If you're new to my blog or not sure what Blessings Unlimited is, I'll give you a quick background. 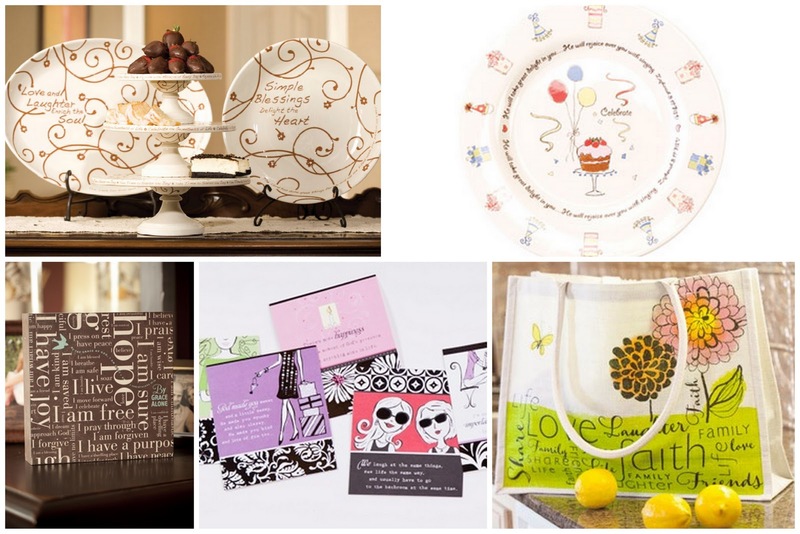 The company opened in 2006, and is owned by DaySpring Christian Cards, which is owned by Hallmark. I've always thought of Hallmark as having a fun, unique style. I think it's exciting that they branched out to home decor and gifts that are geared to inspire and encourage you, as well as bring beauty to your home. And, oh yes, the cards! I had never heard of Blessings Unlimited until May of this year. Between a fabulous post by The Nester and happening upon the products at the MOPS Convention in August, I was sold. The extra spending money has been helpful, and I really really love the products! Many of my orders come in with little prayer cards or Bible verses tucked inside, and I think that's pretty cool. This Giveaway is open to residents of the Continental U.S. There are several ways you can enter between today and Sunday, December 5th, at 5 pm (ET). 2. Let me know if you'd like to receive my monthly Blessings Unlimited e-newsletter with creative tips, monthly promotions, and Giveaways. Be sure to leave your email address! 4. Tweet this Giveaway with a link to this post. 5. Follow this blog through Google Friend Connect (see those little faces on the sidebar? I love those people! ), or let me know if you already follow me through Google Friend Connect. 6. Link up a post (with a valid link!) to this weekend's Weekend Bloggy Reading party for an automatic extra entry. There's a great sale going on right now, with a lot of items 50% to 81% off. One of the platters The Nester featured is on my sale page. Might make a cute gift? Aw, thanks for doing a giveaway! You are so sweet! It is hard to pick a favorite, but I like the Blessings Block sets and the Celebrate plate! I love the Silent Wonder Plate Set! Very pretty! I love a lot of the things you have! I really like the new Tiered Server! I love that the arms are all adjustable so you can arrange it a ton of different ways! I love the Fall Watercolor Decor - the winter one is very nice too! I love the Abundance Wooden Tray! I'm a stalker...I mean follower! Loving SO many of these products, hard to pick one. I'll go with the Celebrate Plate and the As for Me & My Family Tray. Oh wait...that was more than one! I have always loved the 'as for me and my family' tray! I couldn't decide on just one, so here are the three I would have a hard time choosing...The abundance Wooden Tray, the Home Blessing Sign, and the Savor the Joy Cake Pedestal Set. Thank you for hosting this giveaway!! A favorite?? Oh, gosh, how to choose?? 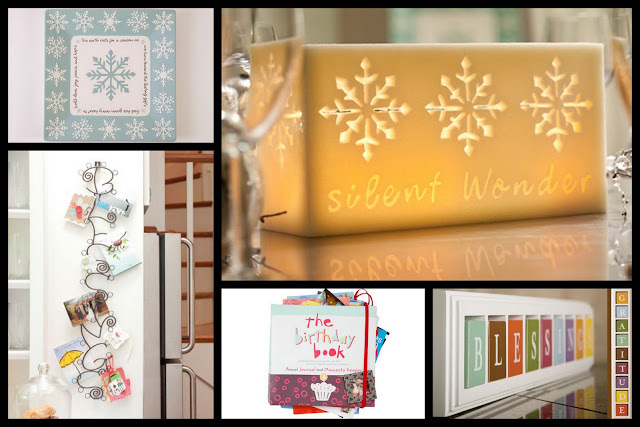 Maybe the "Silent wonder" line of products. That light blue and cream color scheme is just beautiful. But I don't know--I like pretty much everything made by DaySpring! Thanks for the giveaway! I'd love to subscribe to your newsletter (richellap@gmail.com). I'm so proud of you!! The new ever greatful set is so beautiful I'd probably be afraid to use it but the blessings blocks are probably my fav! :-) Thanks for hosting this giveaway! I love the tierd serving pedestal. It's all lovely. And congrats on finding a product you believe in. I really like the Silent Wonder square platter and plate set. I really like the Ever Grateful Collection Mug Wasabi. It would be a pleasure to drink my morning coffee out of it. I have the perfect spot for the Silent Wonder Square Platter in my kitchen. I'm adding that to my "things I want" list!! i love blessings unlimited :) i hope your new venture is going well!! my favorite item is the blessing blocks! i have 2 sets :) but i see there are more blocks? yippee! and that platter? sold out? i really think it is beautiful! Thank you so very much for the chance to win your giveaway! oops.... I didn't get to finish! I like the Blessings Blocks. But there we so many cute things it was hard to choose. Oh yay! I love your products!!! I LOVE LOVE LOVE the platter you are giving away and the Blessing blocks! So many wonderful things to choose from. There are soooo many gorgeous things! I love the Abundance Wooden Tray. That is probably my favorite. I love the "delight yourself in the Lord" bracelet. That new tiered server has my name on it - love all the items. Good luck with your new business and thanks for the giveaway! I'd like to receive your newsletter! Thanks! Myfavorite item is the wooden abundance tray! Kim B.
Hi Amanda! I love the Gratitude table runner and placemats..beautiful!